Aslan, a 17-year-old Syrian teenager refugee has walked more than 300 miles (500 kilometers) to the Greek Island of Lesbos in his quest for a new life with Rose, his puppy. “I love my dog. I need her,” Aslan said. GOOD LUCK, ASLAN AND ROSE! 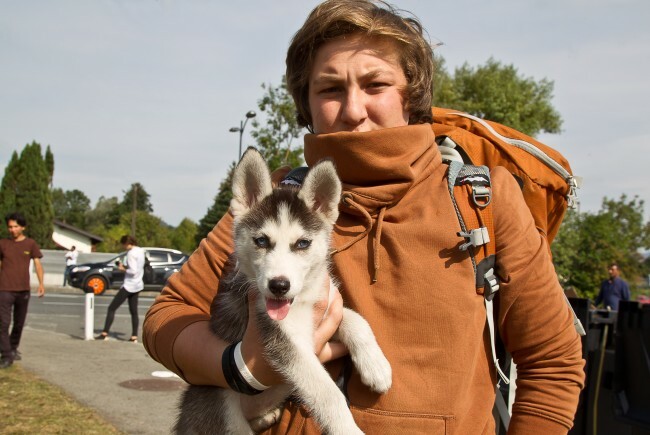 A teenager walked more than 300 miles to escape war-torn Syria with his puppy. Refugee Aslan, 17, took his dog Rose all the way to the Greek island Lesbos as he felt he couldn’t leave his pooch behind. The Syrian teenager is one of 300,000 migrants who have arrived in Greece this year, even making a passport for Rose. Yongki: Another Defenseless and Innocent Victim of Human Greed. Instead of rising majestically to his full height of 10 feet, the massive animal remained on the ground. 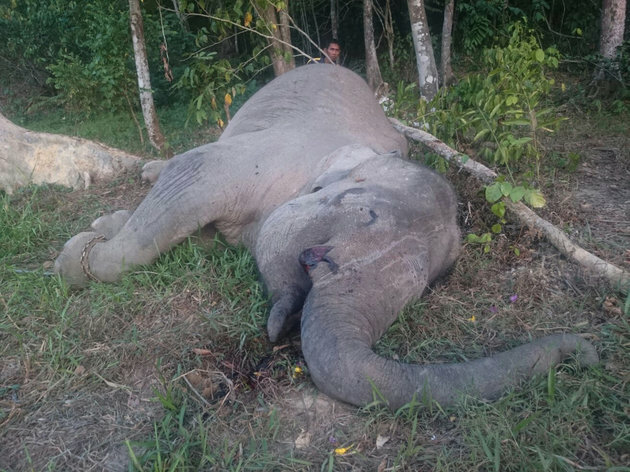 Yongki, an endangered Sumatran elephant, was slaughtered for his precious ivory tusks. “Each year the International Day of Peace is observed around the world on 21 September. The General Assembly has declared this as a day devoted to strengthening the ideals of peace, both within and among all nations and peoples. 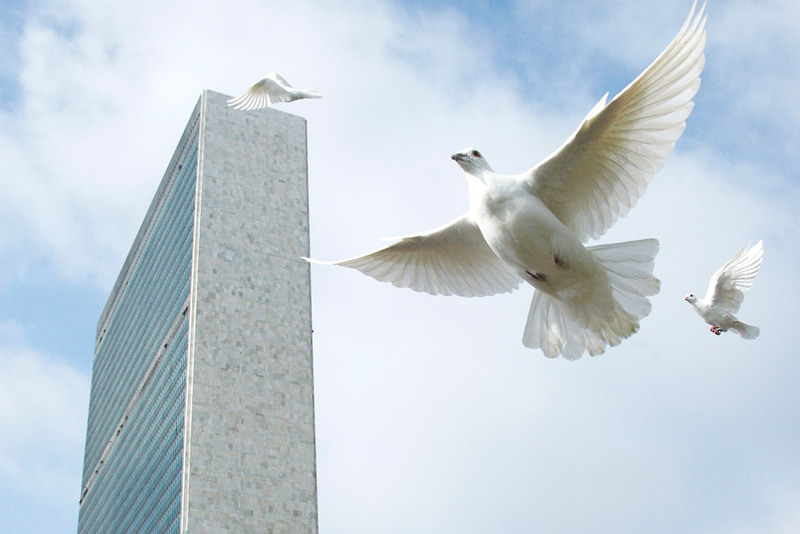 On September 18th Secretary-General Ban Ki-moon called for the laying down of arms and a 24-hour cease-fire on 21 September which is the International Day of peace. For the sake of all beings and the very earth itself we need to find a way to live in peace to learn to tolerate and indeed celebrate our differences, to live in harmony with all that lives before it is too late. As far as we know this world is unique it teems with myriad life but slowly we are destroying this wonderful world of ours as the minority struggle for power and wealth and it needs to stop. At least today lets try and create a little peace in our troubled world. In conflict areas worldwide local people are building peace. Stopping violence, saving lives, healing shattered communities. In the world’s most difficult and dangerous conflicts, local peacebuilders are making a real difference. Every day they risk their lives to build peace and prevent conflict in the places where it starts – locally. Please join our Peace Day outreach by watching the new video “Your Secret Weapon,” and sharing it. If you post the video via a social media outlet, use the hashtag, #PeaceDay, to join millions of people in supporting the cause of peace. Today I am going to make a stand in defence of rats and mice who are probably the most neglected and abused animals on the planet. There are actions you can take further down to help rats and mice, please take as many of these suggested actions as you can. Facts about rats and mice that you may not know or have considered. Rats and mice are highly intelligent, as intelligent as your dog or cat. Like your dog or cat, rats and mice learn and respond to their names. They excel at learning and understand concepts, their memories are outstanding; once rats learn a navigation route, they never forget it. 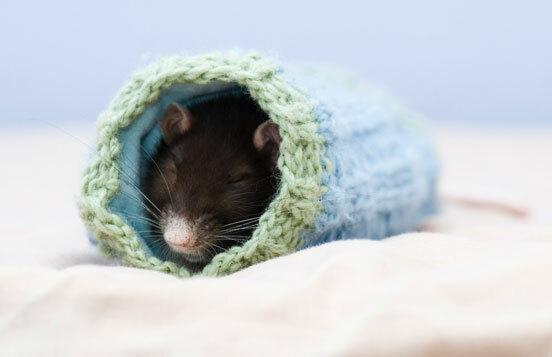 Both rats and mice are social creatures, they form strong bonds with one another and sleep curled up together. Rats are good mothers and like many animals they are playful creatures. Fact – Did you know that rats are less likely than your cat or dog to catch and transmit parasites and viruses? 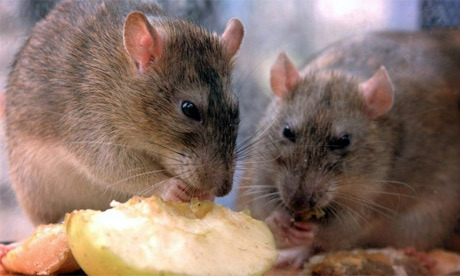 In fact rats are very clean animals spending many hours each day grooming themselves and each other. Yet many people continue with the misconception that rats are the purveyors of disease and should be eradicated at all costs. Fact – Rats and mice make up about a fifth of all species of Mammals, rodents are more closely related to humans than are dogs, cats, horses, elephants, whales, dolphins, and every other order except nonhuman primates. Why do few people defend rats and mice. The human aversion to rats and mice is often extended to other rodents, including prairie dogs, gophers, squirrels, beavers, muskrats, and nutria, who are similarly killed en masse in various parts of the world where they are considered to be “invasive.”But even people who would not countenance any mistreatment of the aforementioned animals will often kill rats and mice by horrendously cruel means, or look the other way while others do the killing, using glue-traps, bone-crushing spring traps, and an array of poisons which may not be legally used against other species. Why are we horrified when cats and dogs are the subjects of cruel experiment yet think its okay to harm rats and mice? There are so few people prepared to defend the rights of rats and mice as they do other animals, the exception being pet rats and mice who are usually white in colour rather than brown or grey, the colours of their undomesticated counterparts. It appears to me that of those of us dedicated to animal rights or animal welfare or whose of us who are vegetarian or vegan, few speak out against the cruel treatment of these rodents. 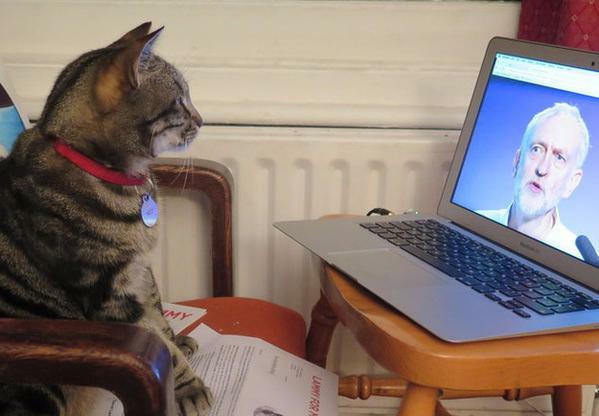 Googling something along the lines of “do vegans care about rats and mice” and you will find little information in support of animal welfare or animal rights concerning rats and mice, few stand in defence of these rodents who are like any other mammal such as your cat, dog, rabbit or guinea pig – the last of which is of course a rodent. So far the only significant stand in defence of these animals is from the People for the Ethical Treatment of Animals PETA and even they actually condone euthanasia in certain circumstances. More about this further down. So who does care about rats or mice? Most of us abhor experiments on animals, poisoning animals or indeed any cruelty to any creature, yet few extend such concerns to rats and mice whom it appears are the exception. Few people, even animal rights campaigners respect rodents – at least the common brown or grey rat or the house mouse. There are exceptions but few in number. 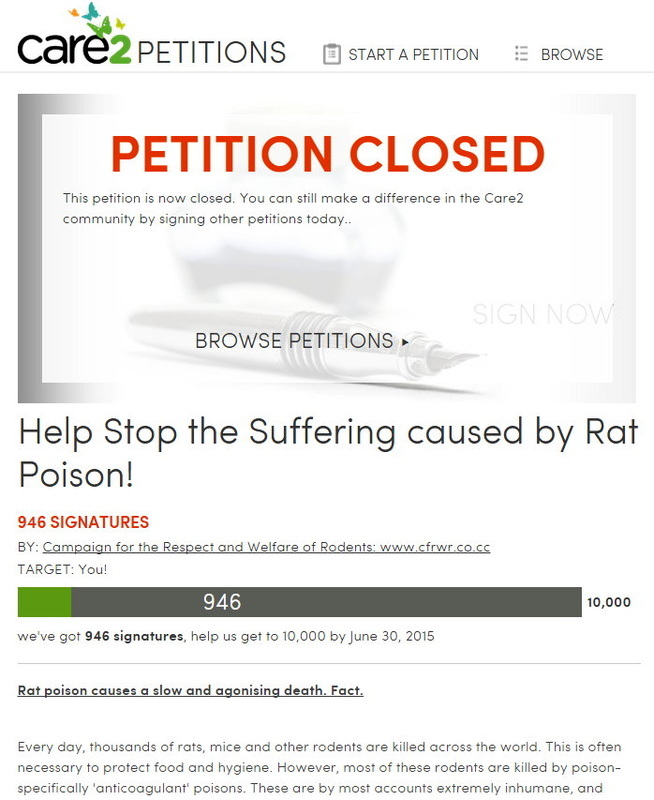 Help Stop the Suffering caused by Rat Poison! Personally I would not kill rats or mice for this reason, there are more humane ways to deter rodents. Your will find humane rodent deterrent information further down. Such treatment of any sentient creature is unforgivable and can never be justified. Please read the following even if you do not live in the USA as it gives information concerning the shocking treatment of these rodents that occurs in laboratories the world over. “More than 100 million mice and rats are killed in U.S. laboratories every year. They are abused in everything from toxicology tests (in which they are slowly poisoned to death) to painful burn experiments to psychological experiments that induce terror, anxiety, depression, and helplessness. Such treatment of a thinking feeling animal is, cruel, inhumane and inexcusable. Published on Dec 19, 2012 a PETA investigator recorded abuse and neglect of thousands of rats and reptiles. Who Cares About Mice and Rats? Mice and rats are affectionate and clever and would risk their own lives to save their friends. However, 95 percent of all animals used in experimentation are rats and mice. Use the link below to help animals in laboratories now! “Rats are very social and affectionate animals. They love being in the company of their own species or humans. They like playing together and love to sleep curled up together. They take care of the injured and sick rats in their group. When rats don’t have companionship, they can become lonely, depressed, anxious and stressed. Still not convinced rats are like any other mammal and deserve our respect and consideration. Every day, mice and rats die in our nation’s laboratories—without even the most basic protections of federal law. Like dogs and cats, these animals feel pain, and studies show that they are clever and great mothers and that they would risk their own lives to save their friends. But even though mice and rats make up 95 percent of all animals used in experimentation, they are specifically excluded from the Animal Welfare Act, the only federal law offering any sort of protection for animals in laboratories. “In an expensive study of the obvious, psychologists at the Graduate Center for the City University of New York designed an experiment to see what effect stress would have on rats who drink alcohol. Of course, rats don’t drink, so first they had to get them used to drinking by mixing alcohol in their water. Continue reading and take action. Please also take the following action if you have not already done so: Use the link below to help animals in laboratories now! Many people however – even those who care – are concerned when rats or mice encroach their lives. What to do about rodents in your home or elsewhere where they are not wanted: Advice to deter rats and mice. Like any other animal, a rat or mouse may not be welcome – I didn’t like cats in my yard because of our adopted rabbit, who is now no longer with us, who used to wander about the yard. Cats can attack a rabbit and so can rats, our rabbit Sooty was bitten by a rat. I would rather not have rats in the yard or mice if they got into the house as is possible as our back door was always open for our house rabbit to come and go as he pleased. Equally I would not want someone’s cat in our house either. This does not mean I lay traps or put down poison for the rats or mice any more than I would for the cat: the cat, the rat and the mouse are all living beings with the right to life as much as you or I or my rabbit. Glue traps and poisons are inhumane and cruel to the extreme as the unfortunate animals often spend days suffering before eventually dying in agony. Rats and mice may not be the only victims as other small mammals get caught in traps or poisoned including wildlife, companion animals and even humans may also come to harm after contact with toxins as was indicated in the petition above. Furthermore these methods of eradication are in the long term futile not to forget the obvious that these animals have a right to life. “Effective rodent-control programs are integrative and adaptive and focus on repellents, deterrents, and exclusion. Rodents are attracted to areas with adequate food sources and shelter, both indoors and outdoors. Eliminate access to food by keeping counter surfaces, floors, and cabinets free of crumbs and storing dry food and pet food in chew-proof containers. Seal trash (use bungee cords on lids), pick up your animal companions’ food at night and never feed them outdoors, pick up fallen fruit and vegetables in orchards and gardens if possible, and never feed wildlife. Reduce hiding places by keeping grass and vegetation trimmed back and by storing outdoor furniture, grills and barbecues, and wood piles away from buildings. Please continue reading the following for more information about how to humanely keep rats and mice out of your home, your garden, yard or elsewhere. I am not sure what the odd advice included in the above link says about rock music, I guess rats can’t stand it as much as I 🙂 Also unless you live in an isolated area I doubt the neighbours would appreciate music all day. Hold on just noticed in the above article – “Rodents can also be humanely euthanized by a veterinarian or at a local animal shelter.” Apparently PETA condone killing a healthy animal! PETA it seems are not one hundred percent in their defence of the right of all animals to life. Shocked? I am indeed. It goes without saying, but I must be clear I do not condone euthanasia – killing – of any healthy living being unless it is in self-defence or the animal is seriously ill. The rest of the information is nevertheless sound and useful. The information is from PETA’s USA website, the ideas though are much the same anywhere. right – well if you think that way what can I say other than it is that kind of thinking that has made this world a place of suffering for myriads of species including our own. We all inhabit the same world sadly many humans consider themselves superior to the other animals with whom we share this world, maybe as a result of anachronistic thinking of a bygone age which now has no place in any ethically progressive society. This world is the home to teeming millions of living creatures, rodents are among them and deserve our respect and their right to life as you or I or any living creature. End The Cruelty of Pheasant Shooting. No matter where you go here in the UK or anywhere else for that matter you can never escape the reality of just how morally backward we are or at least our governments are. To add to the appalling suffering of our own species as a result of the actions of the minority is the unremitting deliberate suffering inflicted on helpless animals in the name of “sport”. Look at the photo below which was taken by myself during a recent family day out to the Lake District, a place we occasionally visit in an attempt to appreciate the beautiful landscape and the hope of finding a little peace and tranquillity. While travelling along one of the winding roads leading to Derwent Water we were amazed to see thousands of pheasants in the woodland, in fields and all over the road. Speeding motorists had run over some and still more came heading from the woodlands in the direction of a large field towards the sound of a tractor and a beating sound rather like that of a drum. Some were running frantically here and there flying in short spates. All of this terrorized sheep grazing in the field who bleated and ran to… well there was no where for the poor creatures to run. Yes sheep are used to birds of course and you often see black birds sitting on their backs while the sheep sit chewing the cud or sleeping quite undeterred. 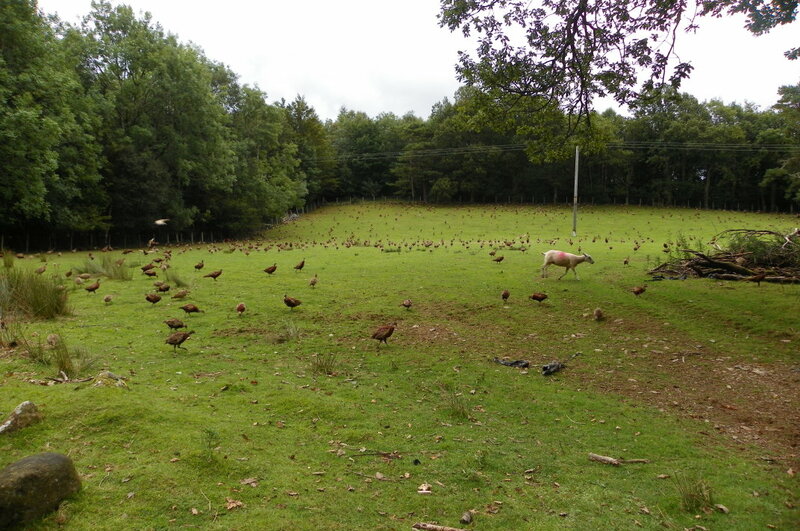 Yet this huge flocking of thousands of pheasants sent the sheep into quite a frenzy of frantic bleating. In a wood right at the far end was a tractor from which a man was throwing what I assume was seed into the field and this is what the birds were after. It took a while to realise that what we were seeing were pheasants who had been deliberately and intensively reared in order for those of an aberrant way of thinking, usually the rich, to massacre these defenceless creatures in their thousands beginning October 1st, which is the official pheasant shooting season. Please watch the video below and click the link for more information from the League Against Cruel Sport. You may find some of the footage disturbing – but please try to at least listen to the information which describes the shocking cruelty inflicted on birds reared for shooting. “Watch the League documentary Gunsmoke and Mirrors which reveals the truth behind the shooting industry. Join us! Please register your support and we will keep you up-to-date with our campaigns and invite you to take action and get involved to help protect birdlife. The more supporters we have, the more we can bring about change to improve animals’ lives. Report incidents of shooting on public access land to the League on 01483 524 250, especially if landowners are preventing access whilst shooting is in progress. I have to say regardless of whether the unfortunate animal is reared for this sickening pastime or simply a bird or other animal in the wild living life as nature intended the killing of any animal is unethical, cruel and in the modern world unnecessary and should be outlawed. There is no place in any modern ethically progressive society for the wanton and brutal killing of the other species with whom we share this world – at least there shouldn’t be. The life of any animal, human or non human is as important to them as our lives are to us. No creature wants to die, the struggle for survival is a powerful instinct shared by all creatures. Pheasants of course are not the only birds to be massacred en mass, August the 12th commenced the grouse shooting season heralding four months of the lawful killing of millions of tiny defenceless birds, disturbance of the quiet of the countryside and significant detrimental alteration of and damage to the countryside to accommodate this disgusting pastime. The sound of gun fire during a hike or stroll through the Yorkshire Dales and elsewhere is disturbing in the extreme knowing that some poor animal has died or has been wounded and may be left to die suffering for many hours. Not to forget also the obvious disturbing nature of gunshot fire with the possibility of accidents and concern for ones own safety. William Ralph Inge – English author, Anglican priest, professor of divinity at Cambridge, and Dean of St Paul’s Cathedral. Two quotes that refer to the dubious and unsavory – in my opinion down right evil – nature of a person who is cruel to animals. Cameron most certainly fits the description of such a person yet he has the power to determine not only what happens to animals but to the 64 million people who live here in the UK and indeed elsewhere. Time to ban out right the wanton killing of wild animals, no exceptions, including the badger cull. Why should we allow the disturbed minority to murder en mass helpless animals, rampaging through our country side taking pot shots at helpless birds, rabbits, hares and just about anything that moves, riding on horse back chasing a tiny fox, or a stalking a majestic deer. Surely it is wrong and if you are not appalled why not? There has to be something very amiss with those who participate and those who condone by their silence. We will never have a peaceful world while we allow people of this ilk to murder defenceless animals whether it is by hunting, shooting, culling or the mass killing of incarcerated animals in farms . We most certainly will never have a peaceful world, a just world while we allow such people to govern the nations of the earth. This news has been around for a few days and somehow I missed it. I cannot however let this great news go without mention. “The United Nations is carrying out an unprecedented inquiry into “systematic and grave violations” of disabled people’s human rights by the UK government, Disability News Service (DNS) can finally confirm. Too many people have die and suffered. Act now and Implement these Select Committees recommendations. It is claimed that the government ignores petitions, whether of not this is true it is still a good idea to sign and voice your opinion, it shows the level of public feeling regardless as to whether or not the government decide to ignore petitions or letters or any other form of protest. The treatment of sick and disabled people, and the unemployed and low paid for that matter, here in the UK during this and the previous Tory government, aided and abetted by the Lib/Dems, is shocking and now that they have the majority is getting ever more abusive and punitive. Along with unfair assessments, cuts and sanctions is the Nazi style campaign to vilify benefit claimants labelling them “scroungers “and “Skivers”. This is outrageous and unethical treatment that has to stop now, such treatment of the most vulnerable in our society has no place in the UK, one of the richest nations in the world. Shame on Cameron and IDS who have violated the human rights of sick and disabled people causing deaths and unimaginable misery. I hope now that finally they will get their comeuppance and that the main instigators Cameron and IDS and all those who enthusiastically supported them will finally be recognised for the evil and vile people that they are and that this grave injustice will end once and for all. Thanks to the grassroots campaigning organisation DPAC who have tirelessly petitioned the UN to launch an inquiry when charities for the disabled and the Labour party have done so little. Maybe just the news alone that the UK government is under investigation by the UN will raise public awareness regarding the violation of human rights concerning people with disabilities. Below are links to articles and personal accounts of the reality of how Tory benefits cuts have affected the most vulnerable in our society. Ignored for the most part by mainstream media these stories need telling again and again and should not be allowed to fade into obscurity. The fact that 25 percent of people who are entitled to vote voted Tory either means that 25 percent of our fellow citizens don’t give a dam about the shocking treatment of people who are unfortunate to a have to depend on benefits, including disabled and sick people, or they are ignorant of what is happening. A third possibility of course is that those who voted Tory believed all the anti benefit propaganda spewed out by biased right-wing media. They shall be remembered forevermore. Read the entire list, more people have died since the list was last updated and there is no doubt that more people have died who have not been included on the list. This is only the tip of the iceberg! People with mental illnesses have seen their already difficult lives deteriorate as a result of welfare reforms. http://www.welfareweekly.com/sanctioned-jobseekers-with-mental-health-problems-are-not-vulnerable-says-dwp/ – please be sure to read the above in full. To comment fully on the outrageous claim that mental illness does not limit functional capacity and vulnerability would need a separate entry. Mental health conditions to name but two of the most obvious and most common, agoraphobia and obsessive compulsive disorder OCD, can incapacitate sufferers in such a way that they can no longer leave their home, sometimes not even one room. Sufferers of conditions such as bipolar disorder and schizophrenia can be even more severely affected. Indeed mental illness can be physically incapacitating in the extreme, such as a person with depression may become catatonic. Even if this was the case people still have to feed themselves, keep warm, pay their rent and so on. Mental illness is a profoundly disabling condition which can prevent a person from functioning in any capacity whatsoever. How the hell can you work if you cannot get out of bed incapacitated by depression or you cannot leave your home as a result of agoraphobia?In fact in some way those with a mental health condition may be more vulnerable because it is far less easy to fight for your rights when your mind is in turmoil as a result of delusional thinking and or anxious fearful thoughts, when thought processes are numbed by depression or you are stuck in the turmoil of compulsive behaviours incapacitated by fear and dread. A sufferer of a mental illness often finds it difficult to communicate either by talking or writing, a phone call can be a monumental ordeal of stress and anxiety. Few understand the effect of mental illness on the entire life of a person who suffers in this way and how added stress can exacerbate symptoms. Publilius Syrus once said that “pain of the mind is worse than pain of the body” and in many ways this may be so, it most certainly can in some cases be just as incapacitating though in a less obvious way than a Physical disability. Disabled and sick benefit claimants are not alone in their suffering as low wage earners are now much worse off since Osborne’s Budget. Well I could go on, there are so many sad tragic stories so much suffering and despair. I doubt if anyone has read all the above. There are many stories as their are injustices as the Tory government carry on with their destruction of our welfare state and if no one stands up to them things will continue to get worse and more lives will be ruined and more people will die. This is not the society we want for ourselves, for our children or future generations. JEREMY BERNARD CORBYN has been a long-time campaigner on animal rights issues. He was one of the first signatories to Tony Banks’ “Pigeon Bombs” Early Day Motion and in 2015 signed a motion calling for a ban on the importation of foie gras into the United Kingdom and sponsored a motion opposing the Yulin Dog Meat Festival. He also sponsored two Early Day Motions relating to the McLibel case. “Alongside our shared commitments to human rights and environmental justice, our party has a strong commitment to animal welfare. As a vegetarian all my adult life, I have used my position in parliament to advocate for greater animal welfare protection.